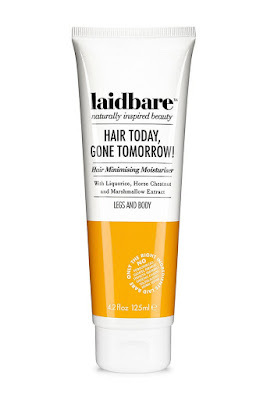 Just over a month ago I purchased Laidbare Hair Today, Gone Tomorrow. I was intrigued to discover a chemical free hair minimising moisturiser. I always assumed that inhibiting the growth of hair would have to involve some kind of chemical. Laidbare has an impressive free from list which includes no petrochemicals, sulphates, parabens, synthetic fragrance & colours, TEA, DEA, Glycols and animal testing. Here is the packaging blurb - A unique solution to inhibit hair growth and to help keep legs and sensitive areas free from ingrown hairs. Benefit: Hair Today, Gone Tomorrow contains a synergistic botanical complex of Liquorice Extract, Caffeine, and Horse Chestnut Seed Extract, which in combination slows down hair growth and re-growth by maintaining the hair cells in their growth stage, with a inhibiting effect. Our blend also acts as an anti-inflammatory to help the skin protect itself from the potential rigours of hair removal. Bonus: A clever daily moisturiser. No more unsightly bumps from shaving and waxing, with no burn. It is suggested to use this product daily and after shaving/waxing. I confess I have only been applying after shaving but I am still seeing great results. The product is a clear runny gel with a subtle fragrance of citrus. My one tip is there is no need to squeeze the tube as the lotion is so running it will come out very easily. A little goes a long way, it absorbs quickly and I am impressed by how soft and moisturised my legs feel. I can apply straight away after shaving and get no burn which is a miracle for me as I always have this problem sometimes with the most gentlest of products. I really feel like the product is working. It has taken a couple of weeks for the product to work but that is understandable as you can expect it to work over night. I have noticed I can go a bit longer between shaves normally I have to do my legs every other day but since applying this product I can go a day or two longer. Over time my re-growth seems to feel softer and lighter. I think the price is excellent value compare to other brands. I purchased a 125ml tube for £6.99. This has quickly become a product that I would not want to be without, especially during the summer months when my legs are out for the world to see.